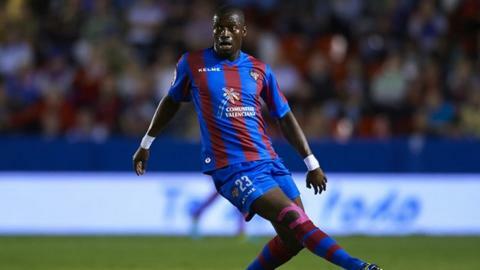 Levante's Senegal midfielder Papakouly Diop has complained of racist abuse from a section of the Atletico Madrid supporters during Sunday's La Liga game. Diop was by the corner flag in front of several thousand travelling Atletico fans at the end of Levante's 2-0 win in Valencia and said he had been targeted with monkey chants. Television footage showed a number of supporters making monkey gestures and Diop responded by dancing in front of them. It prompted a mass brawl involving players from both teams. "When I went to take a corner, I heard the monkey chant - and I tried to defuse the situation by dancing the monkey dance," Diop told reporters. "I wanted them to stop insulting me. "It's a provocation that I have suffered in many stadiums. It has to stop. I don't know if it's racism or a lack of respect. "Directing monkey chants at black players has to stop." The abuse of Diop, which was not mentioned in the referee's match report, came only days after Barcelona defender Dani Alves was the target of a racist taunt at Villarreal when a fan threw a banana on to the pitch next to him. Images of Alves, a Brazil international, picking up the banana and taking a bite were beamed around the world and he was widely backed by fellow players and other public figures. Spanish and European football has long been blighted by racist incidents involving fans with officials criticised for not doing enough to stamp them out.